For the prevention of coccidiosis caused by Eimeria crandalis, Eimeria christenseni and Eimeria ninakohlyakimovae. CAUTION: Do not allow horses or other equines access to feeds containing Monensin, Monensin medicated goat and cattle feeds are safe for use in goats and cattle only. Consumption by unapproved species may result in toxic reactions. LIMITATIONS: Feed continuously. Do not fee to lactating goats. This feed contains non protein nitrogen. Witmer's Feed and Grain does not use "Restricted-Use Proteins" in their products and is in compliance with FDA requirements regarding the use, handling and storage of "Restricted-Use Protein" products. 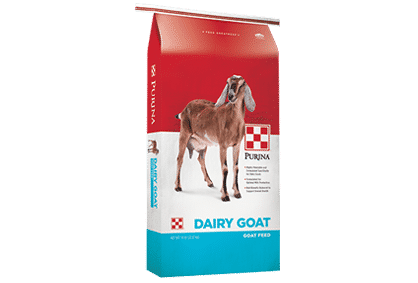 • A wholesome pelleted feed formulated for optimum milk production in lactating dairy goats.